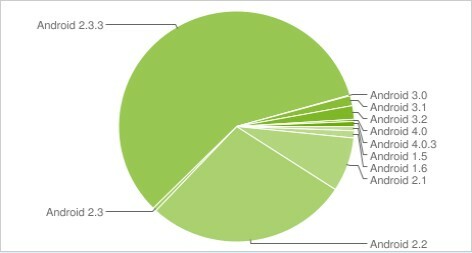 Google just released an interesting set of data showing which versions of its Android operating system are most used by mobile phone owners. 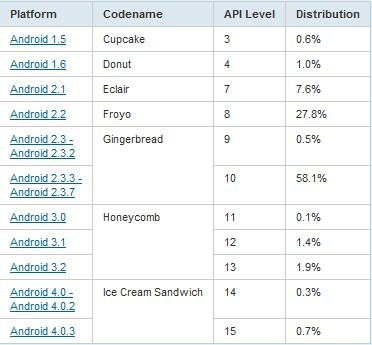 2.3.7) make up a dominant 58.6 percent of handsets while its latest flavour — Ice Cream Sandwich (ICS) — accounts for one percent of phones. The data was taken in a two week period ending February 1, during which Google measured and analysed visitors to its Android Market app store. The sheer number of Android versions, which also include customised OSes such as the one Amazon runs on its Kindle Fire tablet, have seen fragmentation become a significant issue for Google. Executive Chairman Eric Schmidt took a different approach to the issue, however, when he said that the different flavours give greater choice to mobile owners. This variation is one factor that Schmidt thinks will see Android become developers’ number one choice ahead of iOS by June this year. Google gave no specific data on the number of devices covered by the study, however it is likely to be someway short of the total number in existence. Andy Rubin recently announced that it is adding 700,000 new Android device registrations per day, which gives it a (rough) estimate of around 230 million devices at the time of his comments in December.